Rebecca has been in the nest box a lot during the last day. She is restless, occasionally vocalizing, and picking up and rearranging pieces of gravel. 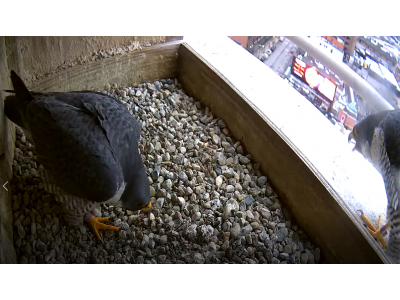 Eggs have arrived in Peregrine nest boxes in Ontario, Pittsburg, and other locations, so we probably don’t have long to wait. It is still cold and below freezing at night, so I hope we can wait a few more days. But, it is certainly not my decision! There is a short video clip from 3/8/2018 of both Kewpee and Rebecca at the nest box. Rebecca arrives first on the video and stays on the ledge. They appear to bow to each other. Bowing and vocalizing softly are allegedly signs of bonding in Peregrines. However, I have seen Kewpee bowing a lot over the years, while Rebecca frequently seems to be vocalizing loudly without obviously bowing. In this video clip, she seems to be bowing slightly, or maybe it appears so because she is perched a bit higher than Kewpee. At any rate, whatever they are doing seems to work for them.